A few months ago a British academic friend of my wife asked me to take some photographs of the graves of fallen soldiers from the First World War who are buried in Maltese military cemeteries. Malta possesses four such cemeteries which are managed by the Commonwealth War Graves Commission, three of which, namely the ones at Kalkara, Pieta and Pembroke contain the resting places of soldiers from the Great War. In my assignment I ended up taking photos of the final resting places of soldiers of a wide variety of nationalities including English, Scottish, Welsh and Irish, Maltese, Australian and New Zealander, Canadian, Japanese, French, Indian and German. This wide range of nationalities is impressive when considering that Malta was not on the front-line during the First World War. The island did play an important role however by receiving thousands of wounded in its hospitals, especially from the horrendous battles that took place in the disastrous Gallipoli campaign in Turkey in 1915, when thousands of young lives were sacrificed, estimated at 70,000 Allies and 60,000 Turks, due to the exposed terrain, the bad weather and the proximity of the front-lines. Malta was a distant 850 miles away from the battlefield and the evacuation of wounded by sea usually took five to six days. Before the war started, peacetime Malta had less than 500 hospital beds. By March 1915 when the Gallipoli campaign was being formulated it was decided to increase the island’s hospital bed-stock to 3,000; however at the peak of hostilities the number escalated to over 20,000 beds. Malta delivered medical treatment to 2,550 officers and 55,400 other ranks during the Gallipoli campaign with the first 600 patients arriving on 4 May 1915. A number of those seeking treatment succumbed to their injuries and were buried on the island. Most of the graves in the well-groomed and maintained cemeteries merely supply name, nationality, rank, regiment and age of the fallen. However a few tombstones go into some more detail, shedding additional light on the person whose remains they commemorate. 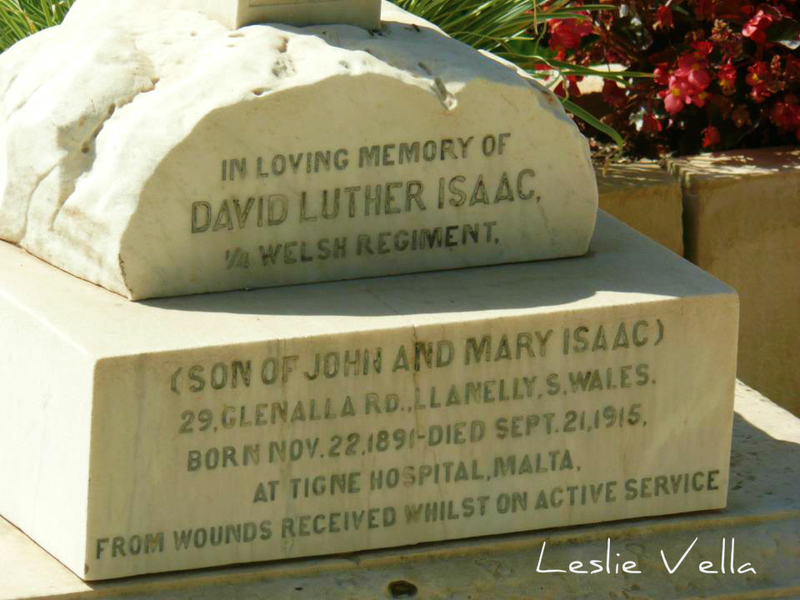 One such case is the tomb of Private David Luther Isaac at the Pieta Military Cemetery. Private Isaac’s tomb stands out not only due to its architectural features, with the marble cross emerging from a rendering of the sand bags so commonly associated with the trenches in which the men fought, but also due to the information the tombstone provides. It tells us that he was the son of John and Mary Isaac who lived in 29, Glenalla Road, Llanelli, South Wales. It also tells us that he fought in the 1/4 Welsh Regiment. Born in November 1891, he lost his life in Tigne Hospital, Malta in September 1915, two months and one day short of his 24th birthday. Intrigued by this information I decided to search for more and found some additional information in a website called http://www.laugharnewarmemorial.co.uk. The most precious detail I found was the photo below. Suddenly the name and details on the tombstone had a face. The face of a young 23 year old soldier who looks much older in full uniform. The site provides some additional information to what is gleaned from the tombstone. 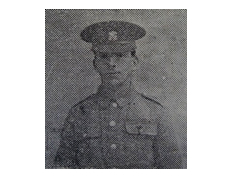 It tells that Private Isaac enlisted in the 1/4th Battalion of the Welsh Regiment in Llanelli itself. This was the local Territorial Battalion, a volunteer reserve force. He was attached to the 159 Brigade of the 53rd Welsh Division. The young volunteer soldier very quickly found himself very far away from home, arriving at Cape Helles, the rocky headland at the south-westernmost tip of the Gallipoli Peninsula on 9 August 1915. The young soldier was thrown into thick action almost immediately upon arrival, defending his post against a massive Turkish counter-attack during the battle of Sari Bair. It was here that he received a severe leg wound and was evacuated to Malta for treatment. In Malta, the young David Luther Isaac was transferred to Tigne Hospital at the tip of Marsamxett Harbour where he underwent surgery to have his wounded leg amputated. The surgery was not enough to save his life and he sadly died of his wounds on 22 September 1915 at the tender age of 23 and barely six weeks after his arrival on the battlefront. He was buried in the Pieta Military Cemetery just outside Valletta. A short story about a young man who, within a few short weeks in 1915, found himself caught in the horrors of war by being detached from his small Welsh community, thrown into the nightmare of a Turkish battlefront which claimed 130,000 lives in eight short months, only to be evacuated to die in Malta where he has rested in peace for the past 98 years. Amazing what a tombstone plus the power of the internet can achieve if one is curious enough.